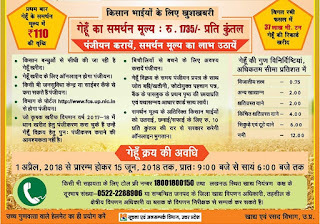 Gehu Kharid Registration Apply Online for Gehun Kisan Panjikaran Scheme to Gehu sell your गेहूं बेचने की चाह in खाद्य एवं रसद विभाग, उत्तर प्रदेश सरकार. 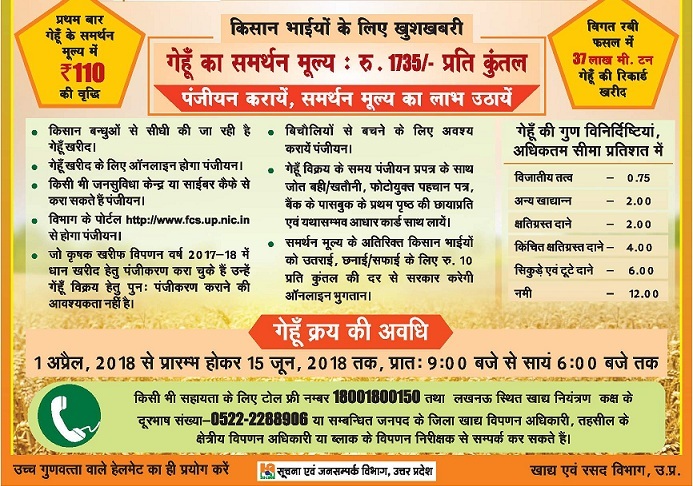 Online Registration for Selling Wheat, गेंहू उपार्जन हेतु किसान पंजीयन. Gehu Kharid Registration If you want to sell your Wheat in Uttar Pradesh (गेंहूँ खरीद योजना) than you must register from official website http://fcs.up.nic.in. Uttar Pradesh, Punjab is Largest Producer of Wheat under Area and Productivity. In India Number on Producer of wheat state is Punjab who have good amount of Fertile Land due to Indus River which gives rich mineral to Punjabi soils. India is called Land of Agriculture country and 60% People of India depends on Agriculture farming. After Freedom Govt has introduced various scheme to double farmer income, decreased the Palayan Rate but they unable to work. Gehu Kharid Kisan Registration:- Recently Government has increased Samarthan Mulya of Gehun Kharid up to 1735 per quintal which means your 1 Kg Wheat price estimated costs Rs 17.35. For this farmer have to register them Gehu Kharid Online in website fcs.up.nic.in and no need to register to old Kisan people who register themselves when on Dhan Kharid registration applied. Kisan Gehu Kharid Registration Latest News: - From 1st April Thousand of Kisan/Farmer started making registration in Gehun (wheat selling) but they unable to sell their Crops due to Demonetization type line in Gehun Kharid Center. 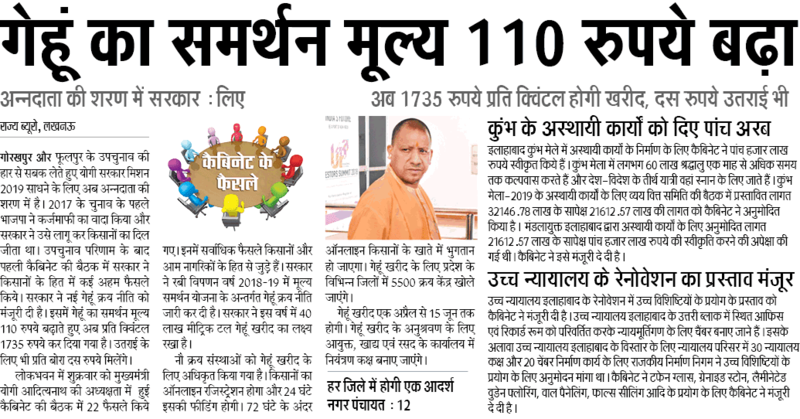 Many Farmer also upset because of selling their crop to Vyapari of Galla Mandi on Rs 1300 to 1400 and they feel highly embarrassed when govt announced to increase Samarthan Mulya. Gehu Kisan Panjikaran: - पिछले वर्ष के रेट 1600 रुपये this year Rs 1735 per quintal क्विंटल गेहूं रेट निर्धारित किया गया that increased to Rs 135. Dhan Kharid Registration: - Jila Khad Vipdan Adhikari said we have created 6 stages to buy wheat, Rice from farmer which is divided into important document, first come first serve. Check below before making line in Gehun Kharid centers. Stage 1:- In First phase make photo copy of भूमि विवरण के साथ ही खतौनी, खसरा संख्या, गेहूं का रकबा भरना अनिवार्य. Aadhar Number or Photostat is also mandatory. Stage 2 to 6:-after completing the first stage process for filling personal details of Bhulekh, Khasra Khatauni, Khata Number that take print out from given format and take it employee who have authority to register your name. गेंहूँ खरीद योजना Gehu Registration Food and Civil Supplies Department.